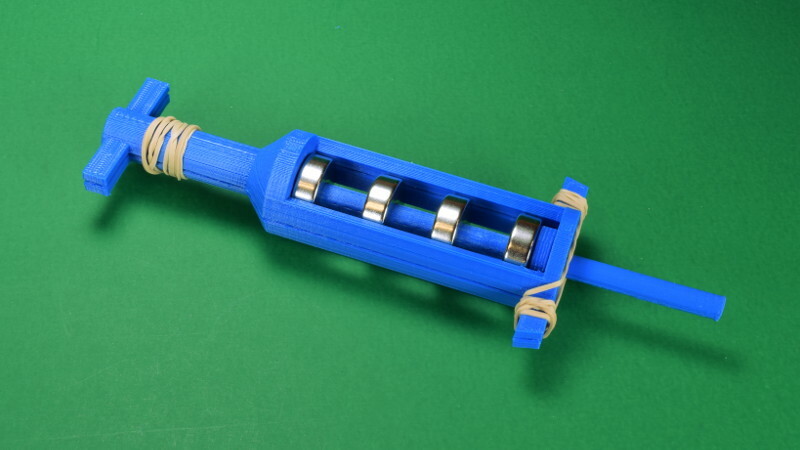 Can Repelling Magnets Replace the Spring in a Pogo Stick? 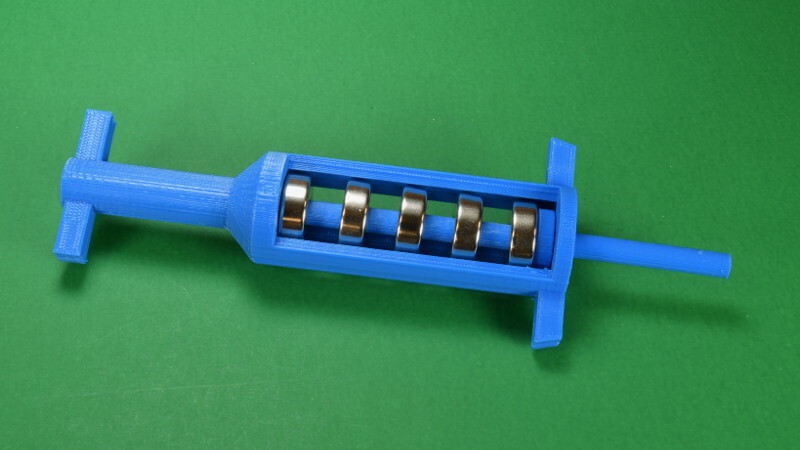 There are many of pros and cons using springy magnets in such situations. Magnets are more expensive than coil springs, but you can have them act across an air gap. We’re not going to focus on these comparisons here. We wanted to explore the differences in the behavior of springs vs. magnets. We got our hands on an old coil-spring pogo stick and measured the strength of its spring. After bouncing around the office a bit, we got a good sense of how much force it provides. Our adult weight compressed it by about 2". We calculated that the force at the full 7" travel is over 500 lb! To get a quick idea of what magnets could do, we built something we could stand on. We had a number of scrap, 2" diameter RY046 ring magnets available, so that seemed like a good place to start. We constructed a small contraption that stacked them together on threaded rod, repelling with a lot of force. Is it the start of a good pogo stick replacement? The forces involved in a real pogo stick are quite powerful, pushing with many hundreds of pounds of force. 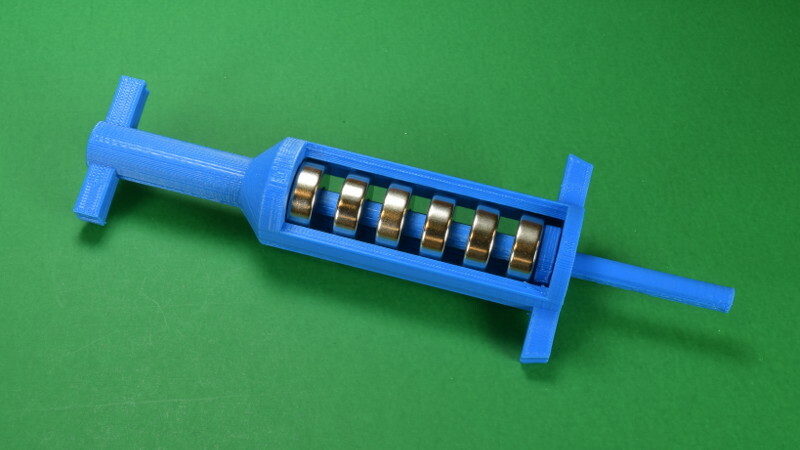 To investigate this topic in more detail without a lot of expensive and dangerously powerful magnets, we created a small scale model, roughly 1/8 the size. A simple mechanical spring from the hardware store seemed a good place to start. 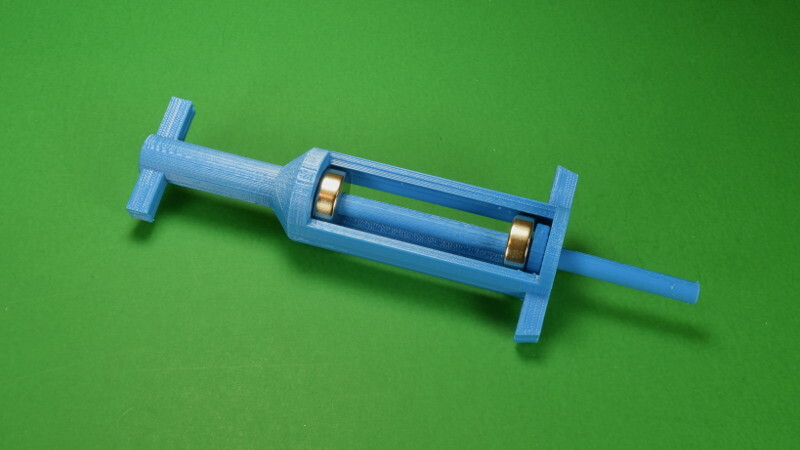 Fit inside a 3D-printed holder we made, we can bounce our miniature pogo stick. 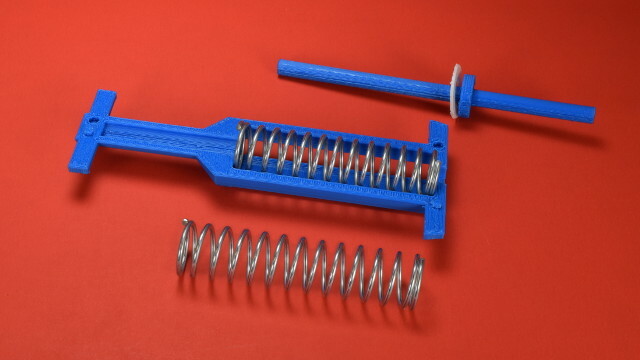 Can we remove the spring and replace it with some powerful repelling magnets? 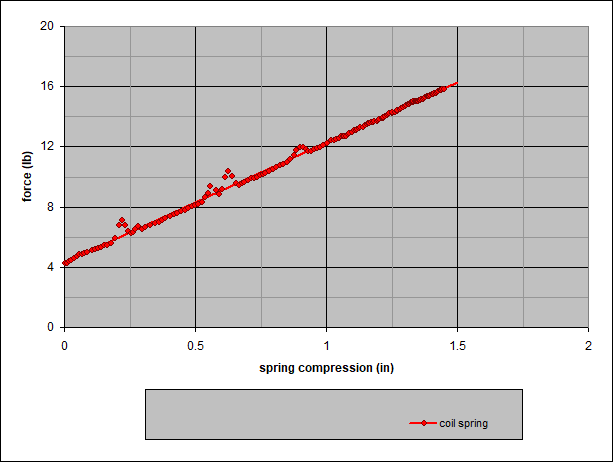 The force (F) equals the spring constant (k) multiplied by the distance the spring is compressed (x). The spring constant (k) of our spring is about 8 lb/in. This describes how much force you can expect as you push down on the spring. If you squish this spring by 1”, you expect the force to be 8 lb. If you go to 2”, you expect 16 lb. Compress the spring 1/2”, and the force should be 4 lb. It’s easy to predict. For a pogo stick, we don’t want the spring to start with zero force. We want there to be some force right at the beginning of the travel. How can we do this? The solution is to preload the spring. We took a 2.938” long spring and squished it into an opening that was only 2.4”. 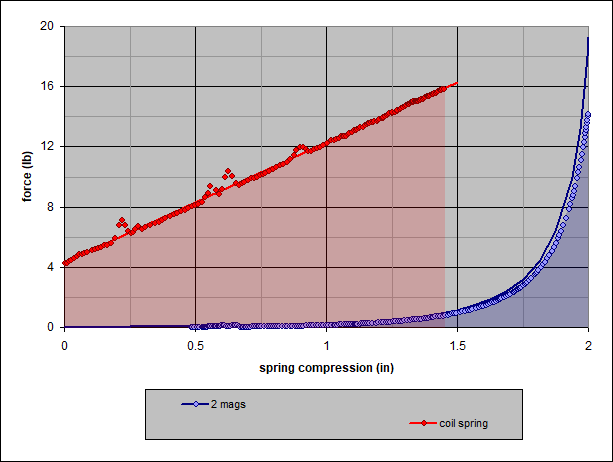 Even before we jump on the pogo stick, the start position has that spring compressed by about 0.538”. 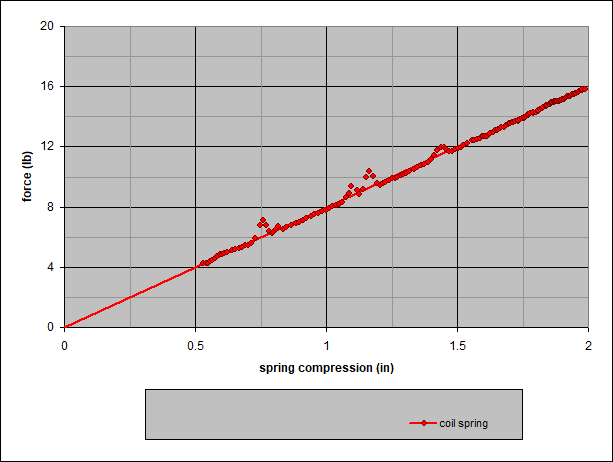 Using our handy spring formula, we can predict that the initial force is about 8 lb/in x 0.538” = 4.3 lb. 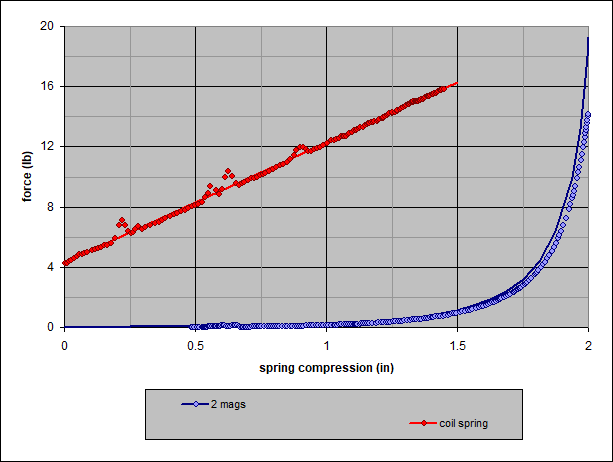 Preloaded Coil Spring, Force vs. 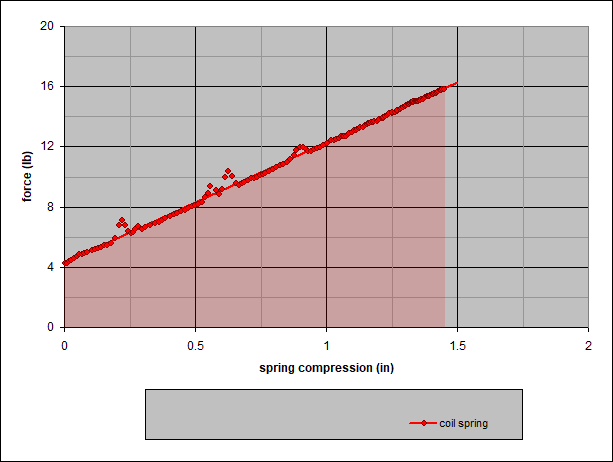 Distance, where the energy in the spring is shown by the area under the line. A key measure of pogo stick performance is how much it shoots up into the air. 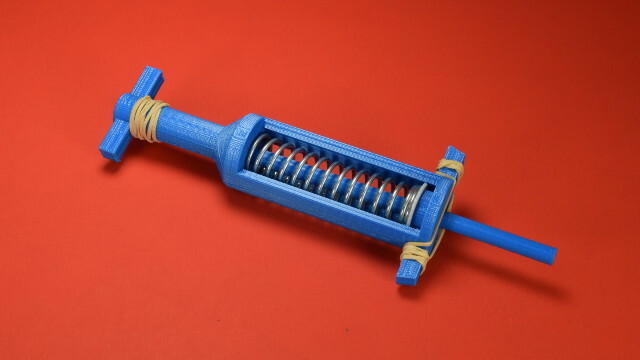 Consider the pogo stick pressed down with the spring fully compressed. Imagine a 15 lb miniature person standing on it. How far will he shoot up when the spring is released? This is really another way of asking how much energy is stored in the spring. 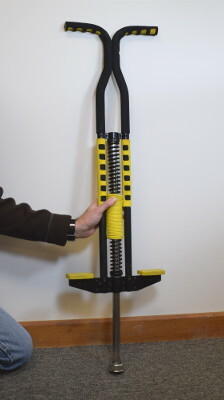 The energy in this compressed pogo stick is equal to the area under the spring curve. The bigger the area, the more energy, the higher we bounce. Magnets, we were supposed to be talking about magnets. Now let’s replace the spring with two repelling, 3/4" O.D. x 1/4" I.D. x 1/4" thick RC44 ring magnets. What happens? Playing with it, something is obvious right away. There’s not much force at all in the first half-inch of travel. We really only feel the repulsion force when the magnets get close together. 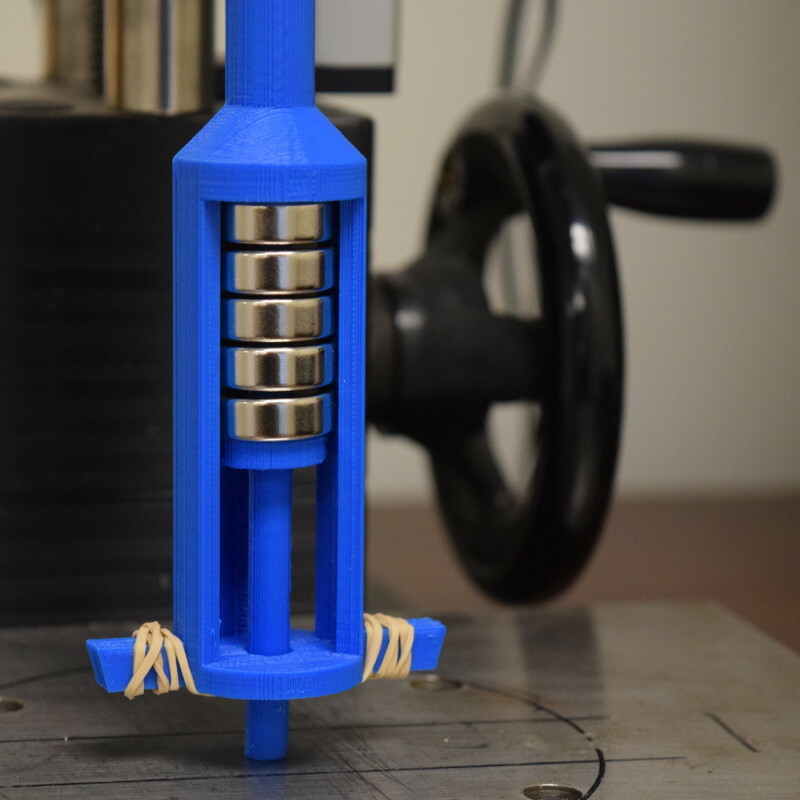 To evaluate the strength of this two-magnet system, we simulated and experimentally measured the forces. The difference between the magnets vs. the coil spring is dramatic. The magnet force doesn’t increase in a straight line like the spring. It’s very weak, and doesn’t start increasing until close to the end. When it finally does, it increases very quickly! You don’t get that nice, gradually increasing force of the coil spring. Not only doesn’t it feel right, it doesn’t perform well either. Remember what we said about the energy being the area under the curve? You don’t have to be a mathematician to see that the area under this magnet curve is substantially lower! When fully compressed, the coil spring had a total energy of about 14.6 inch-pounds (1.65 joules). 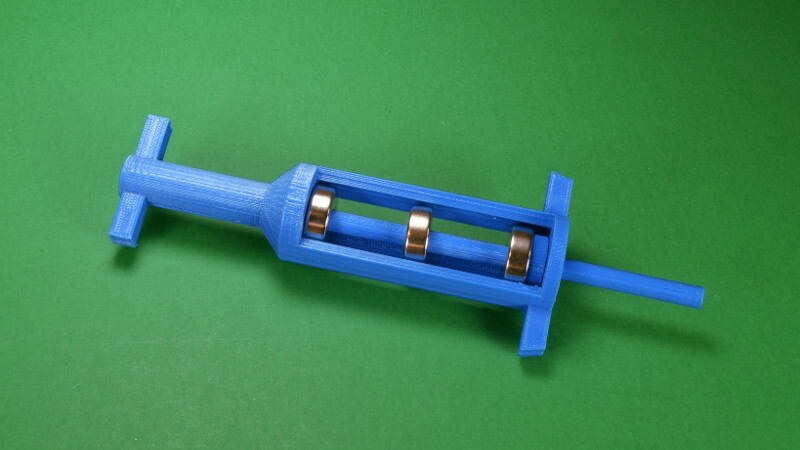 This setup with two magnets is less than 2.8 inch-pounds (0.32 joules). That’s a lot weaker! Got a problem? Add more magnets. What can we do to increase the strength, especially over a greater portion of the travel? Add more magnets. We added a third magnet, alternating which way the polarity faces with each magnet. Each magnet repels any adjacent magnets. This still isn’t anywhere near the strength of the coil spring, but it’s improving in the right direction. We get a bit less force at the fully compressed position, but it increases the force along more of the pogo stick’s travel. This raises up the force even more, but it’s still dramatically weaker than the spring over most of the range of travel. As we add more and more magnets, the thickness of the magnets limits the overall travel of the stick. The more magnets we add, the less travel we get in the pogo stick. With four magnets, the fully compressed magnets are about the same height as the fully compressed coil spring. Now we’re getting even more force, but the overall travel is less than the old coil spring. This sturdy setup showed the most promise. It’s still not the same as the old spring, but the force is similar. It’s weaker in the first 3/4” of travel, then gets stronger at the end. 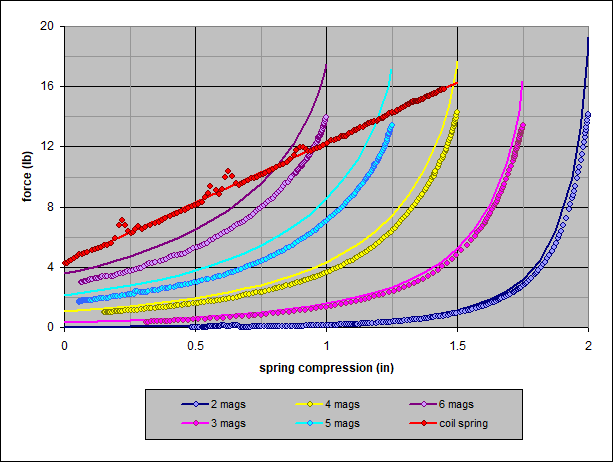 If we only consider the travel between 0 and 1”, the energy stored in the compressed magnets is nearly the same as the spring. That’s not fair to the spring, though, since the next half-inch of travel doubles the energy it stores. That drives home the problem we face -- the repelling magnet setup doesn't have nearly as much travel as the coil spring. 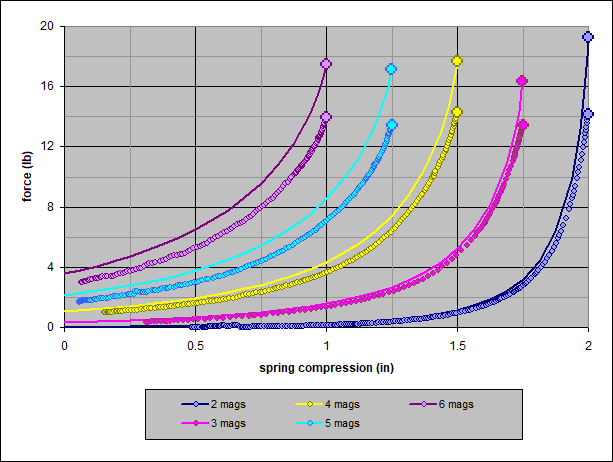 If your spring application needs a tight range where the force is delivered, magnets might be great. For our pogo stick where we want to spread the force over a long springy distance, the coil spring is better. Should you use repelling magnets instead of a coil spring in your next device? As with so many magnet answers, it depends. Do they give you the performance you want where you need it? We found that repelling magnets are very different compared to springs. The way they feel and perform are not the same. For a pogo stick, it's pretty clear that magnets are not a good choice. We probably should have chosen a more pro-magnet application! The two gaps in the middle look smaller than the outer gaps. We compressed a bunch of magnets in a stack, varying the number of magnets. During this testing, we noticed that the spacing between the magnets wasn’t even. For the 4, 5 and 6 magnet stacks, the outermost gaps tended to be a bit larger than the inner gaps. Why? We noticed something that was odd about the maximum pull force when the magnets are fully compressed. As we add more magnets to the stack, the maximum pull force alternates up and down. If 2 magnets repel with some force, 3 is a little less, but 4 is a little more 3, but 5 is a little less than 4, etc. Why is this so? We don't know. This pattern turned up in a number of different scenarios we tried, beyond the one shown here.